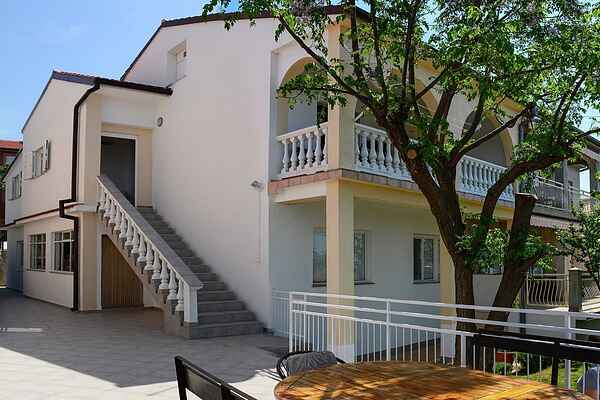 This large holiday house for families or group of friends is located in the town Senj. The most beautiful part of the house is the large terrace with sea view. A part of it is in the shade and there is a table with benches for 12 people. On the 1 floor there is second terrace with sofa set and a deck chair overlooking the sunset, sea, Kvarner islands, the Nehaj tower and the Velebit Mountain.In the garden there is a table and a bench where you can sit, relax and enjoy the view as well as the scents of the Mediterranean; the scents of sage, rosemary, lavender.Behind the house there is a large barbecue with the woods provided. You can use it to barbecue or prepare food under the baking bell. Senj and its surroundings offer various possibilities to those interested in sports and other action-packed holidays. The sea is a constant challenge: dive into its blue depths, try your luck at fishing, or just relax on a sunny beach and take in the healthy maritime air. The mountains also offer plenty of possibilities for recreation and adventure, numerous hiking trails with wonderful views of the surrounding areas, diverse biking trails, free climbing, hunting, caving .